P417076-001, 23.22047.001 23.22049.001 (CR2032-3P) Compaq Presario V3000, V4000, HP Pavilion dv2000, dv4000 Series CMOS Battery. Functional replacement for: part numbers: 417076-001, 23.22047.001, 23.22049.001 and Panasonic CR2032-3P. Compatible Models: Compaq Presario V3000 Series, Compaq Presario V4000 Series, HP Pavilion dv2000 series, HP Pavilion dv4000 series, DELL INSPIRON 1300 and more. This small battery is commonly used in many Compaq Presario and HP Pavilion laptop computers. Our battery is a replacement for the CMOS battery mentioned. 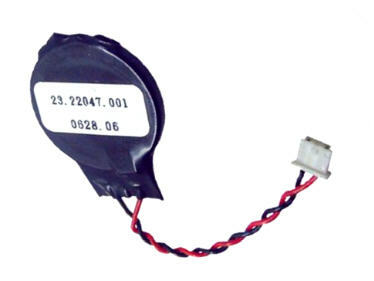 This battery can be used in many Compaq Presario V3000 Series, Compaq Presario V4000 Series, HP Pavilion dv2000 series, HP Pavilion dv4000 series, DELL INSPIRON 1300 etc laptop computers which use a 3.0 Volt clock battery.